Every now and then, we dedicate an article to a LatestFreeStuff fan who has inspired us. Meet Claire Cooper. She has a good head for money management, enjoys free perfume and shares pictures of her freebies with us on Facebook. We caught up with her to find out her secrets to freebie success, and what she’s saving up for. I have never been good with money until recently where I am now saving up so I can move abroad. So I now have to budget all my food and limit where I go for activities. Have you been using LatestFreeStuff for long? I have been using LatestFreeStuff since 2008, so seven years . What’s your favourite LatestFreeStuff category? My favourite category is possibly between the Free Perfume (men’s & women’s) and the Free Pet Stuff. Have you received any freebies this week? This week I have received a small sample of Dior Pour Homme, and the BzzAgent campaign which was the Jacob’s Cracker Crisps. Do you hoard your freebies, use them or give them away? It depends. If the freebie was a perfume sample then I would use it. If it was a free bag of cat or dog food then I would give it to an animal charity. Hill’s Science Plan cat food freebies. What’s the best freebie you’ve received so far? 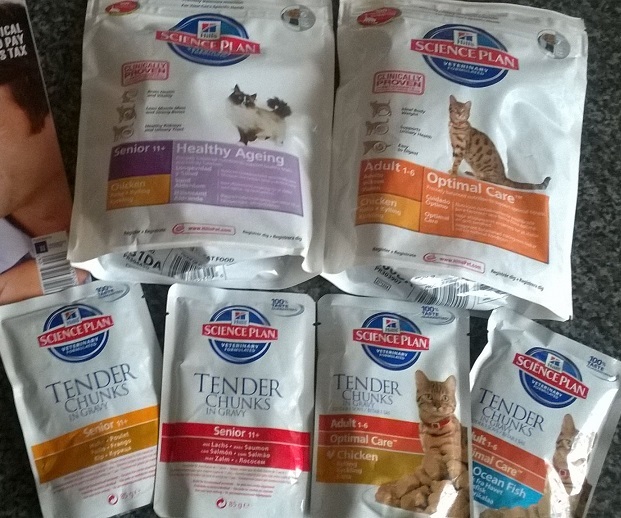 My best freebie so far is from Hill’s Science Plan which contained two 2kg bags of dry cat food and four pouches of wet cat food. What do you think is the main thing we all do wrong when it comes to money saving? I feel that not many people budget. This is why some people spend all their money and never have much left to do activities. Last year my partner and I saved up our money and had a lovely holiday away. Now we are saving up again to move away to start a new life in a new country. What do your friends and family think of your frugal ways? Hahaha! 😀 My family and friends don’t mind me getting free things. As long as it is all legitimate. Some friends have been surprised about how much free stuff I get, so I told them about LatestFreeStuff and they love getting free stuff through their post. Could you give us your top two freebie hunting tips? My two top freebie hunting tips are: always send a compliment letter to a company explaining on how much you like the product, however you feel that some of their products are too highly priced. The company may send you some coupons in the post to discount that product. Or you could enquire with the company if they have a samples that you would like to try. Then if that company says yes then within a week or 2 you will get samples posted to you. Free cat food, magazines, baby food and more. Do freebies ever lead you to buy the product? It depends on what the product is. If it is a perfume that I like then yes I would buy the product. But I do try and compare prices online as well as in shops. Are you an innovative freebie hunter? We’d love to hear your tips and tricks. Please share them in the comments below.